I have never liked sugar cookies. Maybe it’s because my mom was never a fan of sugar cookies, and never baked sugar cookies, and we never had sugar cookies growing up. Maybe it’s because the dough can be finnicky and trying to cut it into those cute snowflake and Christmas tree shapes without leaving half of the dough behind in the cookie cutter gives me anxiety. Maybe it’s because there are no chocolate chips. (Although they do have frosting — I’ll give them that). Whatever the case, they’re just not something we have often ever. But the holidays come and I start to flip through family cookbooks and think back to Christmas gatherings at Grandma and Grandpa’s. And as I came across this one in my cookbook my one Grandma had made for me when I was married, I knew I had to share it. These Sour Cream Cookies are not the difficult, finnicky cookies that require hours of rolling, cutting, baking, and decorating. They are a soft sugar cookie made with sour cream, and they have a fluffy, delicate texture that I find much more appealing. Please note that these are not cutout cookies — you can chill or freeze the dough all you want and you still will not get shapes from these cookies. The flavor is mild and slightly sweet, so they are made to be frosted. If you feel the need to add some lemon zest or extra vanilla, go for it. Yes, they are cakey. This is just the way the recipe is. If your Grandma writes recipes the way my Grandma wrote recipes, you know that they’re a little…. well, open to interpretation. And since I’ve never made these with Grandma, I’m just going to say that these are my best guess at what her recipe actually means. You may or may not get exact measurements. You may or may not get mixing or baking instructions (in this case, there were none). These turned out so soft and luscious and perfectly sweet, that I decided to share the recipe my way. And to my family who may come here and realize I’ve made some crucial misinterpretation — feel free to chime in and translate for me! 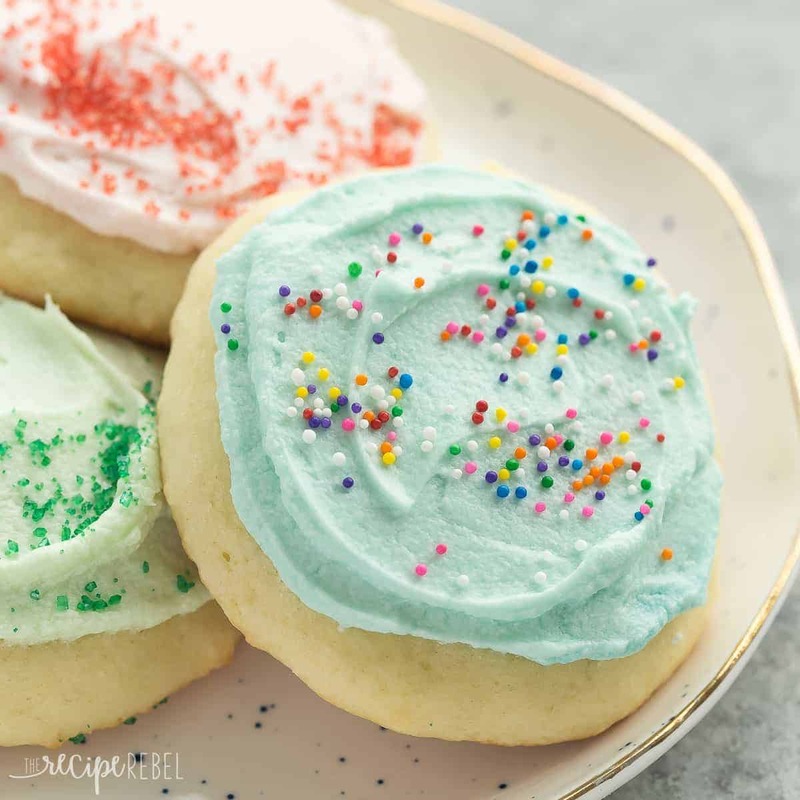 A simple colored frosting and maybe a few sprinkles is really all they need to make them extra special for Christmas, though they are easy enough to make for any occasion…. Or no occasion. Sometimes you just need a cookie! These have been so popular that I’ve added two more versions to the family! 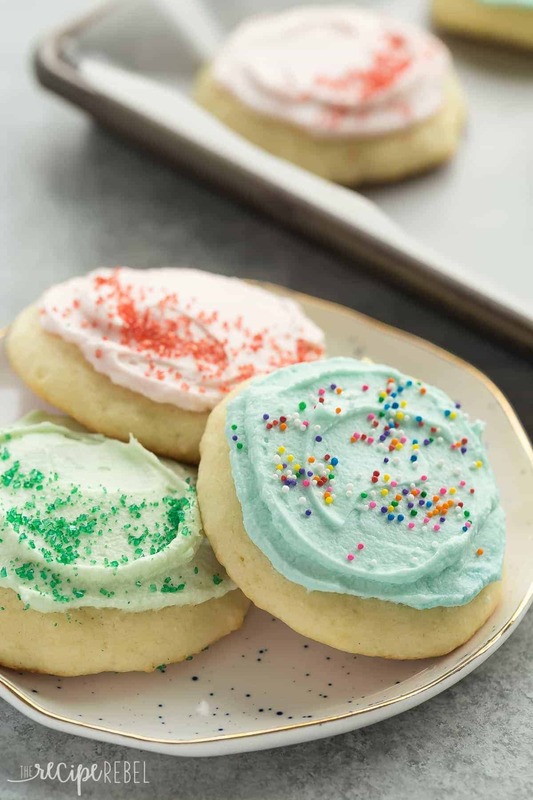 These Sour Cream Sugar Cookies are soft and fluffy with just the right amount of sweetness -- they're perfect with or without frosting and make a great freezer-friendly holiday cookie! In a large bowl with an electric mixer, beat butter and sugar on high until creamy. Add eggs, vanilla, and sour cream and beat until smooth. Add baking soda, baking powder and flour and beat on low until combined -- dough will be soft, almost like cake batter. THIS IS FINE. Preheat oven to 350 degrees F and line baking sheets with parchment paper. Drop by heaping tablespoonfuls onto baking sheets 2-3 inches apart and bake for 10-12 minutes, until edges are golden and centers are set. FrostingWith an electric mixer, beat butter until smooth. Add sugar, vanilla and milk and beat until smooth, adding additional sugar or milk to reach desired consistency (you don't want it too thin!). Color if desired and spread on cooled cookies. I’m excited to try these! Can Greek yogurt be substituted for sour cream? how to store on daily basis? not wanting to freeze. air tight container or not? OMG they r awesome! I increased butter to 3/4 cups and sour cream to 3/4 cups. I folded in the sour cream and I mixed in flour mixture by hand. I’m so happy to hear you liked them! Thanks Carolyn! We love them too! First batch great! Second time I made them, I used my stand up mixer(thought it would be easier). Cookies turned out flat as a pancake :-((( still taste good but definitely not fluffy.read in an earlier comment, to wait to add the sour cream (& fold it in) so as to not ‘break it down’. Maybe that’s what happened? Just sharing for feedback…and any tips for future attempts. I didn’t see any milk in the batter recipe. Or a second recipe. My batter was very stiff, not like cake batter all. The cookies were good though. Ok. Second batch: I added 1/2 cup of milk and used 3 cups of flour and they are marvelous! Just like the ones I used to make as a kid. Yum! I’m so glad to hear that! Honestly, I’ve tried both ways and didn’t see much difference so I omitted it after all just to clear up confusion. But I’m so happy you liked them! Can you refrigerate the dough overnight! Yes, definitely! It just will not firm up much. But they will bake up fine! My batter was stiff as well, not like cake batter. Cookies are fine however, and tasty. Sine they are frosted, I am forgoing doing traditional cut outs this year. I think the family will not be disappointed. Thank you for the recipe. I’m glad that you enjoyed the cookies! They will not be thin like a cake batter, but it should be thinner and softer than regular cookie dough. My batter was super thick too. ??? It will be thick — somewhere between cookie dough and cake batter. Just what I was looking for ! Made these cookies this evening with my kiddos , light , fluffy and lovely ! Thank you ! Yay! I’m so glad they turned out well for you! I accidentally doubled the butter for the cookie. That what I get for baking while distracted. Didn’t realize until after the first batch was out of the oven. They held up though! You would think that doubling the butter like that would make it melt all over the pan right?! Nope. They looked fine, tasted good. They are outstanding, thank you for the recipe. I will double check my measurements next time lol ? O my gosh I did to and I didn’t even realize it till I just read your comment!! ? I’m glad they turned out well anyway! What if I want to use cookie cutters? Do I just refrigerate the dough for a while? This recipe cannot be made into cutout cookies unfortunately. Made these today and that are amazing! Thank you! I’m so happy to hear that Cheryll! Hi! Can you freeze them with the icing on them? Thanks! Definitely! Just wait until the frosting is completely set and layer with wax paper in a freezer safe container. I’m confused to by video, is it 1/2 a cup of butter or half a stick? (1/4 c) Also, can you use oleo? It’s 1 stick of butter. I made the cookies & would like to freeze them. Can they be frozen after being frosted? Yes definitely! I usually freeze them completely frosted, just wait for the frosting to set completely and layer them with wax paper. The ingredients listed in the recipe are the measurements used. I’m not sure what oleo is so I can’t say for sure! 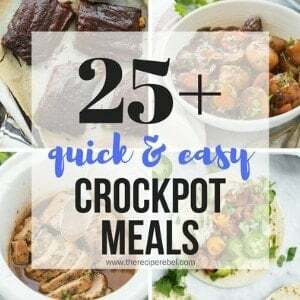 Can you please share the cut-out recipe? When I make these cookies I usually make them quite large, so you could easily get 3-4 dozen smaller cookies! I hope you enjoyed them! 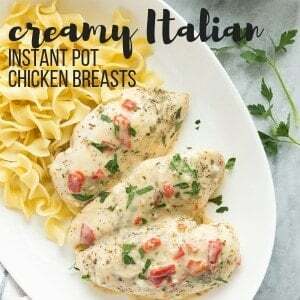 I would love the cut out version recipe please. I would like it too, please! Could you please list the cutout recipe. Thank you! 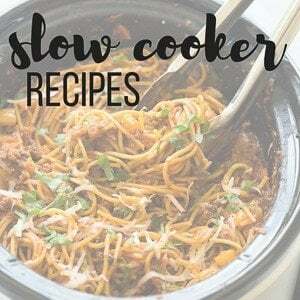 I would love the cut out recipe please? I just made these and they are awesome! I do have one question. What’s the best way to store them? I usually freeze them with wax paper in between. I’m so glad you like them! Grandmas have the best recipes! These cookies are perfect for the holidays! 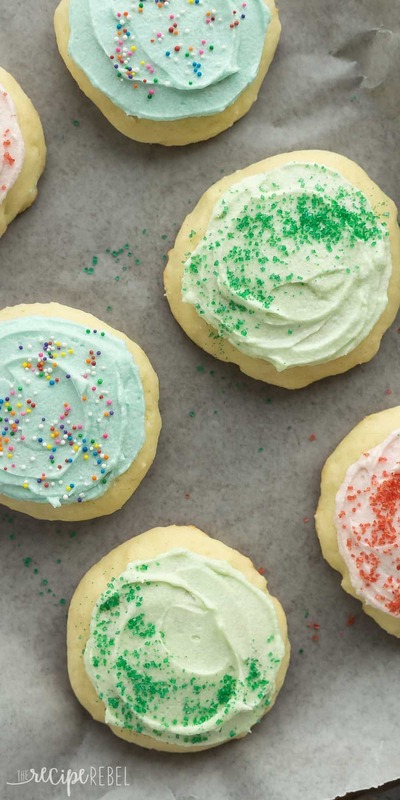 The best way to make sugar cookies is definitely involving sour cream. These are so light and delicious! 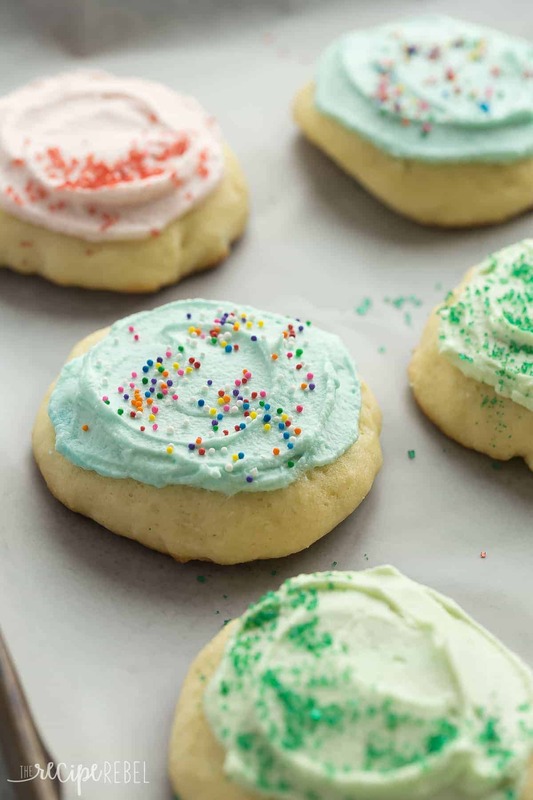 These are a must have on our holiday baking list every year! So soft and perfect! OH these cookies remind me of my grandmother. She use to put sour cream in everything. Always gave it so much extra flavor. I am excited to try these this Holiday season. Yes, it adds so much! Thanks Becky! Can you freeze Grandmas sugar cookies after you back them. They are not soggy, just soft! They are soft and cakey, maybe a slightly cakier texture than your average grocery store cookie. They definitely stay soft after freezing! They thaw quickly at room temperature on a plate with paper towel. My granddaughters, ages 7 and 3, helped me to make these cookies. Everyone loved the cookies and we can’t wait to make them again! I’m so glad to hear that Linda! How would you freeze this dough? Would you freeze the whole batter in a ball or drop the cookies, freeze and then put in a freezer bag? This dough doesn’t freeze very solid (I put in the freezer to test and it is still scoopable), so I would freeze it as a whole but not for as long as you might other cookie dough. These were awesome! Super easy and tasted great. My 14 year old daughter and I made them together and the recipe was easy for her to follow with minimal help. The family loved them. I’m so happy to hear that Gabrielle! “…dough will be soft, almost like cake batter. THIS IS FINE.” Thank you! I have my great-grandmother’s sour cream cookie recipe. The first time I made it, I actually threw out the dough, believing she had accidentally written down the wrong measurements. Tragic. I decided to google “sour cream cookies” to find the right ratios and found your version, then tried my grandmother’s recipe again. Saved. I will have to try your version next! Typically, my great-grandmother and grandmother did not provide instructions either but there are some interesting tidbits in her sour cream cookie recipe (minus the helpful “dough will be like cake batter”). 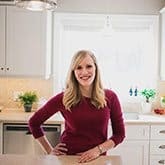 Our recipes are so similar I wanted to share. 1. She creamed the butter and sugar until fluffy. 2. She then added well beaten eggs to the creamed mixture. 3. She combined the flour (sifted, which is somewhat unusual for a cookie), salt and soda. 4. She alternately added the dry ingredients and the sour cream–to avoid over-mixing or breaking down the sour cream. 5. She added the nutmeg last–which Martha Steward does too so….validated–and noted raisins were optional. (No thanks to raisins, I like the delicate flavor better without them.) There was no frosting recipe on my great-grandmother’s card so I’m anxious to add that to the mix. Thanks again! I love your site! That is so interesting! It is definitely a challenge trying to interpret Grandma’s recipes after she’s gone, but well worth it! I’m so glad you found me! These are my absolute favorite of all time. My Mother made these and they were a neighbor’s (Mrs. White) recipe. Mom made them for the neighbors, the nuns, the priests at Christmas time. My brother Michael got to deliver them to all. This was back in the 60’s. You are definitely right about sifting the flour. One time my Mom threw out 5 batches of dough because “it wasn’t right”. She finally realized she had forgot to sift the flour!!!! That’s a great tip Marlene! I never sift the flour (and I can promise you my Grandmother didn’t either 😉 ) but I definitely don’t think it would hurt! Thank you! Thank you! I have been trying sugar cookie receipes for at least 40 years (I’m 66) looking for this cookie that I remembered from summer Bible School snack time. Munching under a tree with ice cold Kool-Aid. No idea who made them..lots of churches together…I am beyond being a happy woman!!! Childhood favorites are the best! I remember my Grandma used to decorate them as little piggies with pink frosting and marshmallow noses. They’re a classic for sure! This is pretty much the same recipe as the Old-Fashioned Sour Cream Drop Cookies from the 1950 Betty Crocker cookbook. This is a family favorite. Whipped cream cheese vanilla butter frosting can be flavored with a little orange or lemon or lime juice… is a good icing for this cookie. Why did you heat cookies? It says beat cookies. Could this be the problem? Can left over dough be refrigerated? I usually mske my doughs a day or 2 b4 using and wondered if this would be ok to do with this recipe? Hi Lucy! That should be totally fine 🙂 The dough will not firm up significantly in the fridge. I wondered if I can make the dough today and freeze it to bake on Christmas Eve? These sugar cookies turned out wonderful! I tried some sugar cookies my mom brought home from a friend that were so soft and good, so I wanted to find a recipe that was close to hers. I believe your recipe exceeds her cookies! Oh wonderful! I’m so happy to hear you liked them! Definitely! It will not become overly firm, even in the freezer.